Some of you may recall the posts about my two week printmaking residency last June at Crow's Shadow Institute of the Arts. Their "Monothon" fundraiser is going on this weekend, and I had the pleasure of attending today and making a few monotype prints. Artists from all over the region converge to work in the print facilities. Ten or twelve of us at a time take three-hour shifts working with Master Printer Frank Janzen and a team of energetic volunteers. The prints produced are offered for sale on the last day to make money for the institute's worthy programs. 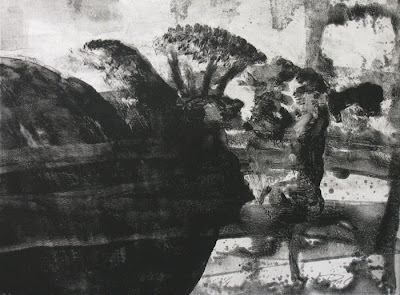 Monotypes are one-of-a-kind prints made by painting inks on a sheet of clear acrylic plastic, then laying paper on it and running it through a hand-cranked press. 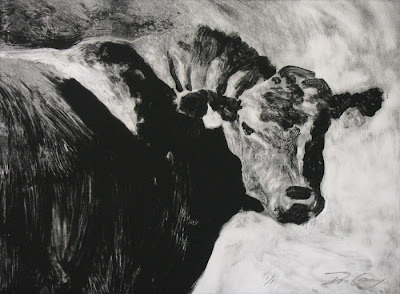 I decided to work with the image of the Angus bull I painted for the October 1st daily, just to see what changes the image would undergo in this different medium. The process is spontaneous and unpredictable...lots of accidents, happy or otherwise; but it's that sense of experimentation and discovery that makes it enjoyable. Of course the three hours whiz by and just when you feel you're getting warmed up, it's time to quit. Oh well, it was still fun. It's interesting Don how the different print-offs show a variety of mood. For instance the second one down shows best to me the power of the animal whilst the last one shows its vulnerability. Sounds like you had a great time! Oh wow, those are really neat. Will you be doing more? Thanks Sheila, it was a good time. One of the interesting things about monotype is how one can quickly explore different treatments or expressions of the same subject. Hi Gabrielle--good to hear from you. I hope to do some more monotypes before long--I do love doing them. Hi to all your family! Black and white is refreshing to me--I took a look at your web-site--beautiful paintings--I was drawn to the vessels, but then I love the portraits on...what was it... Laminated paper? Amazed at the amount of murals you've done! Good job!! Don, in the monotypes were you using a water-based or an oil-based ink? If you paint the original image on plastic, then it seems that an oil based ink would work better. If you're printing on paper with an oil based ink, then what type of paper is it? I'm guessing it wouldn't be that hard to gesso paper first. Also in lieu of a press, have you tried any prints using a rolling pin or spoon? Love the images. Very strong. One reminded me a bit of an aquatint, a look I really love. Hi Susan--thank you for looking at my work in depth. I'm afraid the variety of things I do is bewildering to many, but I can't help myself! 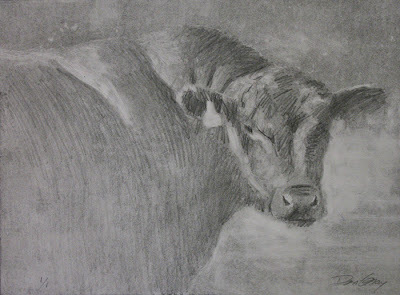 Oil-based, Joan--in this case, a Daniel Smith etching ink. The paper is Rives BFK--a beautiful printing paper. When I did the residency I printed on Stonehenge, which is also gorgeous. I also did a few watercolor monotypes, by coating the plastic sheet with a layer of gum arabic to allow adhesion of the watercolor, then running through the press with slightly dampened paper...some beautiful effects. It's even fun to paint watercolor on the plastic without the coating, allowing the shrinking and beading of the paint to be part of the piece. 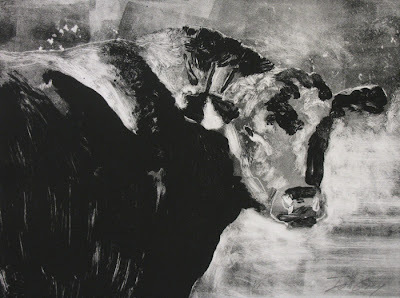 I have done monotypes without a press, using wooden spoons and the like. My favorite pressure tool is a pint glass jar. Have never gessoed the paper, but that might be interesting too. Thanks for the encouragement, Joan. Thanks very much for the info, Don. I would never have thought of using gum arabic; will give it a try. Ditto for the pint jar. My pleasure, Joan. It's great that we can all share info and learn from one another.